Here's a detailed side-by-side comparison of how the GoPro HERO4 Silver compares with the HERO3+ Silver in terms of features, capabilities, and performance. 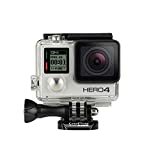 The GoPro HERO4 Silver is a significant upgrade in features over its predecessor, the HERO3+ Silver. But it's not a direct overlap, and if you're trying to choose between these models, there are situations where the 3+ might be a better fit. So here's a breakdown of the key differences between the two models to try to help you decide which will work better for you. There are a couple of big differences between these cameras as well as several smaller ones. But let's start with the highlights first. The most obvious difference between the HERO4 Silver and the HERO3+ Silver is the one that you notice as soon as you turn the cameras around. The HERO4 Silver is the first that has a built-in touch display LCD screen. It offers a live view of what the lens sees as you're shooting as well as playback and menu controls. These are things that have become pretty standard on most cameras these days, so it might come as something of a surprise to hear that GoPros were so slow to this particular party. But there have been some good reasons for that, including the challenges of adding a screen to such a tiny camera and finding a way to make the battery life still usable. The downside of an LCD screen is that it drains the battery more quickly. So if you want to maximize battery life you'll want to turn the LCD screen off or use it sparingly. 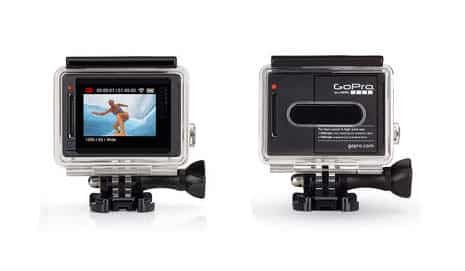 The 3+ Silver, like all of the other GoPros before it (and some since), doesn't come with a built-in LCD screen. By itself, you point the camera in the direction you want it and hope for the best. Because of the wide-angle lens, that often works well enough. And you can't play back videos or photos on the camera itself. But you can add an LCD touch screen as an optional extra. It's GoPro LCD Touch BacPac. Not only does that add an extra cost--and not a small one, at that, but with the screen attached the camera won't fit in the standard waterproof housing because it creates a bulkier package. It's also going to drain the battery even more quickly, something that's true of the HERO4 Silver's built-in screen as well. With both cameras, you can also get live view remotely by using the free GoPro mobile app to get a live view wirelessly on your phone or tablet. So the upshot is that the built-in screen on the HERO4 Silver edition is convenient for shooting, it's less bulky and cheaper than adding the accessory screen to a 3+ Silver, but it comes at the cost of reduced battery life because of the power demands of the screen. How much of an affect that has will vary greatly on how you're using the screen. Both of these cameras have quite powerful video capabilities, but the HERO4 Silver definitely has the edge here over the HERO3+ Silver. Most notably, it can shoot at the much larger 4K resolution, while the 3+ Silver maxes out at 1080p. There are trade-offs, of course, in limited framerates that are available at 4K. 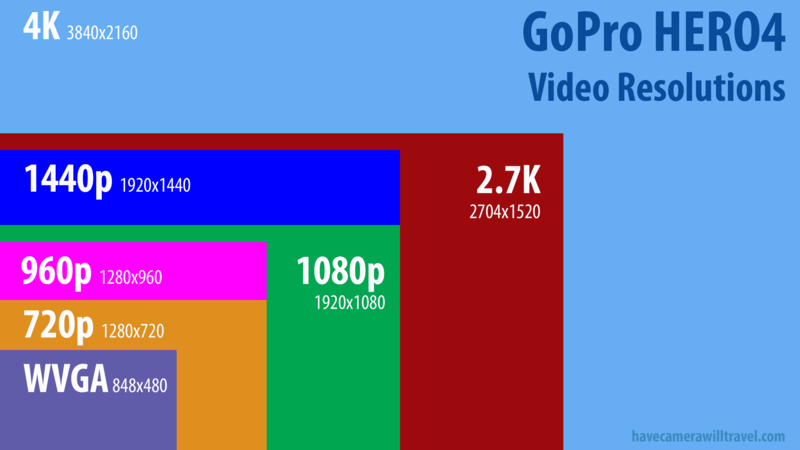 Here's a visualization of the video resolutions that GoPros produce. Click on the graphic to open a full-size version. 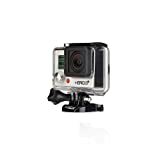 They both fit in the same housings, and if you're taking them in or around water, you'll need to put them in a separate, clear standard housing to make them waterproof--neither is waterproof on its own in the way that newer GoPro models are. Both models shoot still photos and can shoot timelapse stills (to compile into video later with software on your computer). The newer camera has a new night-time shooting mode, a slightly larger still photo size (12 MP vs 10 MP), a faster burst rate (30 shots per second vs 10), and adds Protune (not available on the HERO3+ Silver). The the HERO4 cameras also use different batteries than the HERO3+ and HERO3 ranges, so if you've got spare batteries from previous models, they're not much good to you in the HERO4. Both of these cameras are now discontinued, but you can still sometimes find new copies available at retailers. Other options are picking up refurbished or used copies.